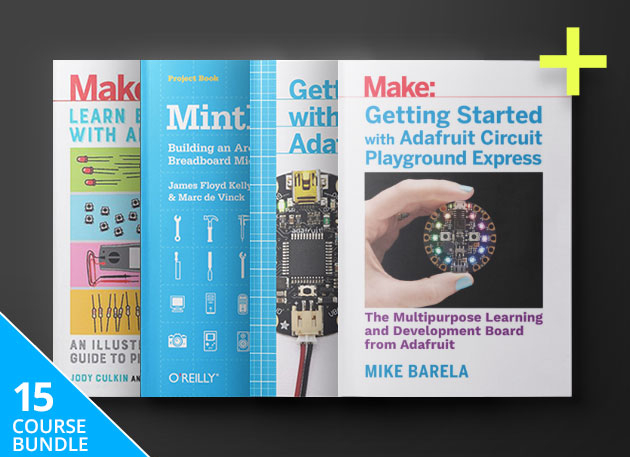 The Make: Arduino Hacker eBook Bundle is 15 ebooks from Make, the leader in DIY electronics. The bundle guides you through creating wearables, robots, and more with Arduino. From interactive programming to creating on-the-go wearables, you can do it all with Circuit Playground Express, the multi-purpose learning and development board that’s perfect for DIY electronics newcomers. In this beginner-friendly eBook, you’ll learn how to get up and running with this board and utilize its built-in sensors for a number of interactive projects. You’ll come to understand the basics of coding in multiple programming languages and learn how to create your own IoT programs. Make: Basic Arduino Projects is the companion book to the popular Ultimate Arduino Microcontroller Pack and details over 25 different projects to get you channeling your inner tinkerer. Using the Ultimate Arduino Microcontroller Pack (not included) or equivalent hardware, you’ll walk through creating multicolor flashing lights, timers, tools for testing circuits, sound effects, motor control, and more exciting DIY projects. Getting Started with Adafruit Flora is your beginner-friendly guide for building wearable electronics projects using Adafruit’s FLORA board. Written by Adafruit’s Director of Wearable Electronics and Creative Engineer, this eBook is your definitive introduction for creating DIY electronics with this computing platform. You’ll learn how to plan your wearable circuits, sew with electronics, and much more as you make your way through this eBook. DIY Environmental Monitoring with Arduino is your wall-to-wall guide for using Arduino to create devices that can measure noise, weather, electromagnetic interference (EMI), water purity, and more environmental factors. You’ll learn how to collect and share your findings with the world, and you can also create your own variations of the projects included in this eBook. And, no worries if you’re new to programming: the first chapter has you covered with a primer on electronic circuits and Arduino programming. What better way to dip your feet into the inventive world of Arduino than by learning from its co-founder? Co-authored by Arduino co-founder Massimo Banzi, Getting Started with Arduino: 3rd Edition contains everything need to know to get started with this amazingly popular open-source electronics prototyping platform. You’ll learn from detailed, hand-drawn illustrations and flex your newfound knowledge with guides for two hands-on projects! Netduino is an open-source electronics platform based on the .NET Micro Framework, and it’s quickly becoming a popular pick among DIY electronics gurus due to its improved computing power. Getting Started with Netduino: 1st Edition provides step-by-step guidance for experimenting with Netduino and the .NET Micro Framework. Following along a number of quick projects, you’ll learn how to create networked devices that communicate over TCP or IP. Blending the ease-of-use of Arduino’s classic boards with powerful hardware, the Arduino 101 is the logical next step forward for any tinkerers looking to expand their creative potential. Jumpstarting the Arduino 101 offers a comprehensive look at using this board to its full potential. Jump in, and you can get started with this platform as you explore neural net pattern matching, gesture recognition & more of its exciting features. Filled with color illustrations, easy-to-follow explanations, and step-by-step instructions, Learn Electronics with Arduino is the perfect starting point for creating your own projects on the Arduino platform—no experience required! You’ll get a solid introduction to basic electronics theory and programming concepts, as well as digital and analog inputs and outputs, so you can start building circuits, writing sketches, and more with Arduino. Learn how to build devices with both the Lego Mindstorms NXT 2.0 and the Arduino prototyping platform in this beginner-friendly guide! Make: Lego & Arduino Projects: 1st Edition shows you how to bring Arduino functionality to the Lego Mindstorms kit, allowing you to create everything from a drink dispenser to a music synthesizer and wireless lamp. Following along step-by-step instructions and clear illustrations, you’ll get your feet wet building a number of projects for this exciting platform. Assemble an Arduino-compatible micro-controller and build a complete MintDuino project from start to finish with this step-by-step eBook. DIY MintDuino: Building an Arduino-Compatible Breadboard Micro-Controller has you channel your inner creator by making a MintDuino reflex game. You’ll walk through all the necessary steps for wiring up and programming the MintDuino controller, and get the skills to start working on your own MintDuino projects. From our smartphones to self-driving cars, we’re surrounded by Internet of Things (IoT) devices, and you can start making your own with this easy-to-follow eBook. Getting Started with the Internet of Things walks you through using micro-controllers to interface with the real world. Using a Netduino Plus micro-controller, you’ll learn how to build a web server, send sensor data over the web, and much more as you make your way through this eBook. Many aspiring hobbyists shy away from using Raspberry Pi and similar platforms because they require understanding Linux. However, the reality is that Linux isn’t all that difficult to understand—especially when you have an expert walking you through it. From loading the OS to troubleshooting and prepping projects, this beginner-friendly guide walks you through the Linux OS and how you can add its open-source power to your own DIY electronics projects. Compact, economical, and Arduino-compatible, the Adafruit Trinket is a brilliant platform for DIY electronics hobbyists to get their feet wet in the field. Getting Started with Adafruit Trinket walks you through the essentials of using this board and offers a number of hands-on projects to refine your skills. Inside, you’ll find over 15 projects for the AVR ATtiny85 Board. Whether you want to build an intruder detector or weather monitor, you’ll going to have to get savvy with sensors if you want to create an Arduino project that interacts with the physical world. Complete with a wealth of high resolution imagery and delivered in a friendly, understandable tone, Make: Sensors 1st Edition offers an introductory overview of how to use the myriad of sensors on the market in your own Arduino projects.